Analysis of ancient DNA recovered from an extinct South American mammal from the last Ice Age has allowed it to take its rightful place in the tree of life with a group that includes horses. It is the first time that DNA has been recovered from Macrauchenia patachonica, which is considered one of the more puzzling species to have lived during the last Ice Age. The DNA allowed researchers to map its relationships and place it within a group that includes horses, rhinos, and tapirs. The species was one of the last South American native ungulates and has baffled biologists for more than a century. It likely weighed as much as 400-500 kilograms (850-1,100 pounds). The new study, led by scientists at the University of Potsdam in Germany and the American Museum of Natural History, has been published in the journal Nature Communications. Charles Darwin found the first native ungulate fossils in South America in 1834, at sites in Uruguay and Argentina. He passed them on to the renowned British paleontologist Richard Owen for study and description. Owen was flummoxed by Macrauchenia’s unusual combination of features, which made it difficult to ascertain its correct relationships. That problem persisted for the next 180 years, with many further attempts at clarification but none widely accepted. Owen initially thought Macrauchenia was related to the living llama because of its long, camel-like neck, but rejected the idea when more remains were found. One of Macrauchenia’s most unusual features turned out to be the position of the opening for the nose. In most mammals, the nasal opening is situated at the front of the skull, just above the front teeth. In Macrauchenia, this opening was placed high on the skull, between the eye sockets. Did this feature imply that Macrauchenia had a trunk, something like an elephant’s? If Macrauchenia was partly aquatic, as some have argued, was the external nose used like a snorkel? Or was it more like a large inflatable balloon, utilized in dominance activities or mating displays of the sort seen in some seals? Solving the Macrauchenia problem ultimately required mitochondrial DNA, extracted from a fossil found in a cave in southern Chile, and a new approach to recovering the extinct mammal’s genome. The multinational team that tackled the question was led by Michi Hofreiter, a paleogenomics expert at the University of Potsdam in Germany, and Ross MacPhee, a mammalogist and curator at the American Museum of Natural History. “Mitochondrial DNA is very useful for evaluating the degree of relatedness among species,” Hofreiter said. “We had a difficult problem to solve here: Macrauchenia doesn’t have any really close living relatives,” said lead author Mick Westbury, from the University of Potsdam. “Because ancient DNA is so degraded and full of unwanted environmental DNA, we rely on being able to use the genomes of close relatives as a kind of scaffold to reconstruct fossil sequences. The team eventually recovered almost 80 percent of the predicted mitochondrial genome of Macrauchenia. With this information, they were able to place Macrauchenia in its proper phylogenetic position as a member of the larger grouping now called Panperissodactyla. Ancient relatives of the living members of Perissodactyla were already in existence by the beginning of the Eocene epoch, 55 million years ago. The team was able to take advantage of that fact, along with other information, to calibrate or “tune” a molecular clock to determine when evolutionary splitting events occurred. Using this approach, the researchers determined that the Macrauchenia’s lineage and that of modern perissodactyls split about 66 million years ago — at about the same time as one of the largest extinction events of all time, caused by an extraterrestrial impactor striking the planet close to modern Yucatan. The new calibration is considered to be compatible with, but more accurate than, the one produced by the 2015 collagen study. McPhee said: “While the coincidence with the extinction of nonavian dinosaurs was not lost on us, molecular clock dating is more like a sundial than a digital watch — it’s just not that precise. 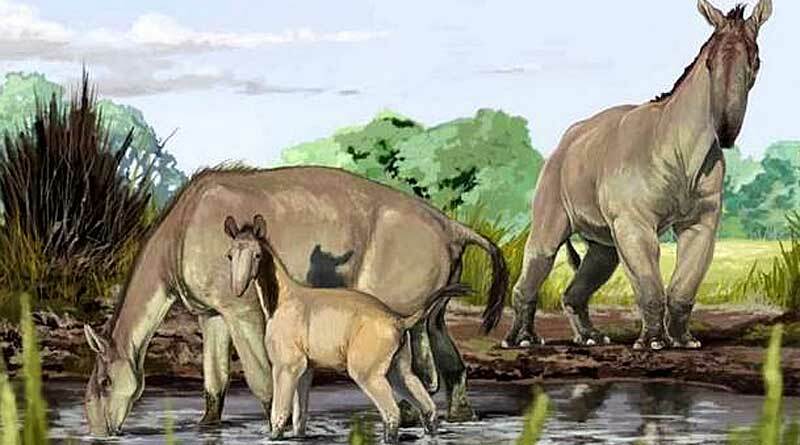 “While fossils certainly support the idea that the modern orders of placental mammals really began to diversify around this time, molecular evidence suggests that their broader relationships go back into the late Mesozoic, before the big die-off. Although a large number of samples were processed for this study, in the end only one, from the southern part of Chile, actually yielded verifiable DNA of Macrauchenia. The researchers said that was disappointing but not unexpected, as cold conditions, like those found in permafrost regions, are by far the best for DNA preservation. However, the cave locality that produced the successful specimen is actually within the temperate region of southern South America, which suggests that it is worth testing late Pleistocene samples of other South American native ungulates, such as the rhino-sized Toxodon, which Darwin, who was not usually given to overstatement, considered “the strangest animal ever discovered”. This work was funded in part by National Science Foundation grants and a European Research Council, grant.